Learn about the different types of data customization you can do with New Relic agents. Start by learning how to use the agent API to add custom instrumentation for a more detailed and in-depth view of what’s going on in your application, how to send custom data about your app to your APM account for a more complete picture of your app’s performance, and the ways your users engage with your app. Then learn how to use the New Relic REST API to create customized queries on metric data such as application server response times, page load times, and number of transactions and page loads and event data like error rates and application server performance. Finally, learn how to set up and use deployment tracking to understand changes in your apps, pre- and post-code releases. Describe the difference between custom instrumentation and custom metrics, and the types of custom data that can be added using the APM agent API. Determine when to add custom instrumentation, when to add custom metrics, and what type of customization to use. Add and interpret custom instrumentation and custom metrics. 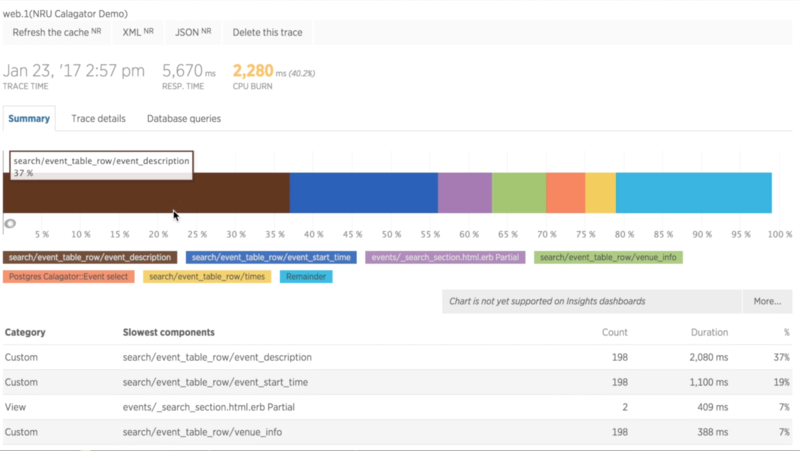 Learn how to insert custom event data the New Relic language agent APIs, which you can then query in New Relic Insights. Learn how to use the Ruby agent API to add custom instrumentation to dive into transaction trace details where there isn't enough visibility to determine the cause of a performance problem and get the details you need for a more complete picture of what’s going on in your application. Learn how to add custom instrumentation, discover new performance data about your app by analyzing your custom instrumentation results, and fine tune your APM data for full visibility into your app's performance. Knowledge check for adding custom data with the APM agent API.